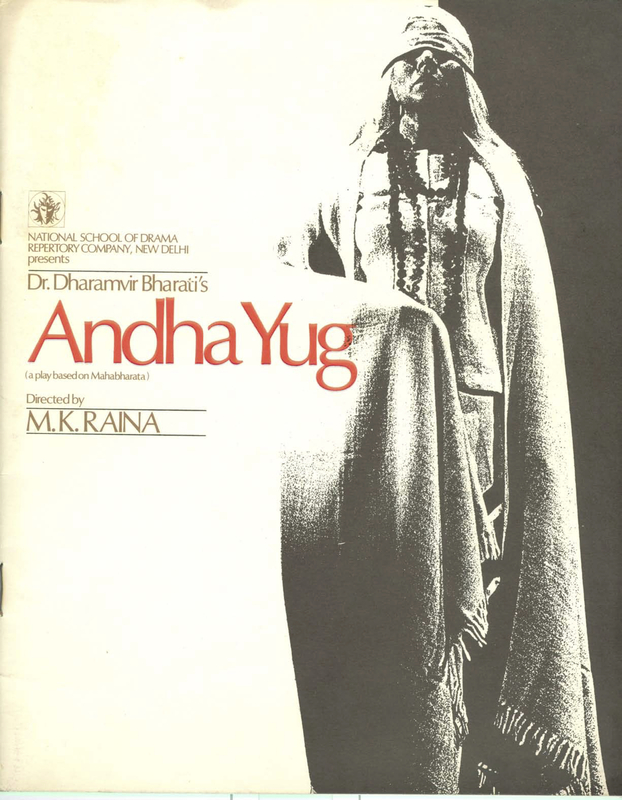 Dharamvir Bharati's Andha Yug (1954) is a verse play from the narrative of the Mahabharata. The play is a selective elaboration of the aftermath of the 18-day war between the Kauravas and the Pandavas. Bharati specifies the time span of the play as extending from the 'evening of the 18th day of the Mahabharata war to the moment of the death of Krishna in the Prabhas tirtha.' Andha Yug best exemplifies the merging of literariness and theatricality. The Mahabharata emerges in Bharati's play as a locus of grief, futility, savagery and death after serving as the source of heroic example. Andha Yug is the first notable post-Independence play in an Indian language which acquired monumental reputation through Satyadev Dubey's production in 1962. Later, we have a succession of productions by contemporary directors, including Alkazi (1964, 1967, 1974), Ratan Thiyam (1974, 1984, 1994), Mohan Maharishi (1973, 1975, 1992), M.K. Raina (1977 and 1986), Bansi Kaul (1983), Ram Gopal Bajaj (1992), Ajitesh Bandyopadhyay (1970), to name just a few. The languages of performance have included Manipuri, Assamese, Marathi, Bengali, in addition to the original Hindi.